Cyclothon UK was initiated in 2011 and continued in 2012 by VU Ltd. 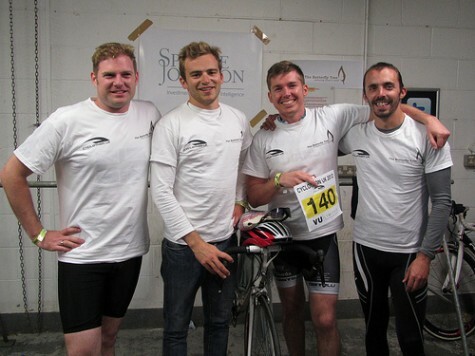 The Butterfly Tree were awarded a free team place to participate in the challenge, which entailed a 12 hour endurance cycle around Brands Hatch circuit in Kent. Four team members, Mike Kaye, Nigel Birch, Jake Wilson-Gunn and James Blackburn, named the ‘Flying Butts’ came a respectable fifth in the challenge after competing against professional cyclists. The Flying Butts completed their second endurance challenge at Cyclothon UK 2012. Starting at 07.30 the team of four cycled around the Brands Hatch Circuit until 19.30. There was a cool breeze in the early hours of the morning, but fortunately the sun shone brightly for most of the day making it an enjoyable event for both participants and spectators. The Flying Butts with existing team members Mike Kaye, Nigel Birch and James Blackburn, the fourth member was Richard Harrison raised a substantial amount of funds, which have been used to set up a Football Academy at Mukuni Village. This initiative is run by local people and encourages both boys and girls to enrol to keep them away from the dangers of drugs and alcohol. No matter how small raising funds can help buy essential exercises books, vital mosquito nets, go towards building community houses and classrooms for schools or to sponsor an orphan. For further information or to request advertising material contact us.